Exterior Architecture recently had the opportunity to submit proposals for the landscape of the iconic Roshen chocolate factory in Kiev, Ukraine. We were one of six teams chosen to develop a design for the competition amongst a select, international cast of Landscape Architects including teams from France, the Netherlands and the Ukraine. We approached the competition in a playful mind frame and on a sugar high after a site visit to Kiev. Our vision for the scheme was a layered cake, referencing the local culture as a base, taking the story of chocolate as our inspiration for the filling and icing it all with reference to the distinctive Roshen branding. We envisaged a destination that would encapsulate the pleasure and anticipation of unwrapping a sweet, a landscape for a special day out. We proposed a series of exciting spaces with a focus on children and family outings. The journey starts in the Origins Garden, exploring the far-flung nations that produce the raw materials of chocolate. This leads to a playscape themed around the transportation of these materials before continuing on a terraced walk that tracks the history of Roshen. An interactive zone at the factory entrance uses pipes as play features and brings the inner workings of the factory into the landscape. 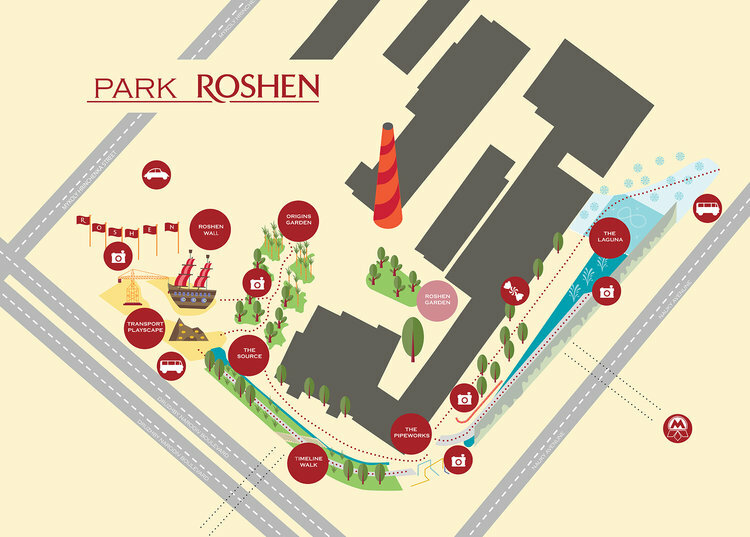 The Roshen showground at the front of the factory building is proposed as a new premier piece of public realm within Kiev and includes the Roshen Laguna - a large water body fed by a cascading wall that becomes an ice rink in the winter months. The social aspect of the design was central to our proposals and we looked at how the spaces could accommodate a whole range of community activities throughout the year. Easter egg hunts, outdoor film screenings and Christmas markets were amongst the events that we foresaw taking place. We collaborated with our friends at Light Follows Behaviour to create some spectacular lighting proposals, animating the building façade and transforming the landscape by night. We also worked with Bamber Wallis to develop the unique water features within the scheme. Whist ultimately unsuccessful, our proposal was highly commended by the judges and we had a great time developing our ideas.